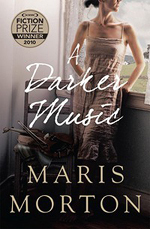 The blurb of A Darker Music describes the book as a mystery, but the clues here are glimpses into the past, rather than fingerprints and surveillance tapes. At the centre of the mystery is Clio herself, a flawed and not always likeable character who is nonetheless easy to sympathise with. Through Mary, the reader is able to view the world of Downe with an outsider’s eyes. As she learns about the day-to-day running of a sheep farm, so does the reader, a technique that is a little obvious at times, but does not detract from the interesting nature of the information being conveyed. The supporting cast of characters is well-drawn, from likeable farm workers to Paul, Mary’s cold and taciturn husband. For me, however, it is the location of the novel that sets it aside from other stories with similar themes. Not only does the rural setting give it a strong sense of place, but it also acts as a gentle metaphor for Clio’s own isolation.